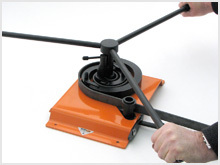 Our Mk 3 3 scroll bender is the mid range version of our very popular capstan operated metal scrollers and complements our Master range of Metalcraft tools with its ability to work with steel bars up to 25mm x 5mm (or 10mm square or round) solid bar. As with all of our capstan type scroll bending tools, the material is gripped in the central segment and rotation of the three handles draws the steel bar into the interlocking segments to form a scroll upto a maximum size of 210mm across depending how far the handles are rotated. The outer segments can also be interchanged to create different steel scroll shapes. This very reasonably priced tool produces consistent and great looking scrolls to incorporate into your wrought ironwork or general metalworking projects. 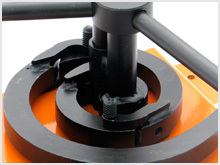 Open out segments and ensure pressure roller is set towards centre of scroll former before gripping steel in centre of tool with locking bar arrangement.